... where the delicate shape wraps itself round the wrist in matchless comfort. Every year, Bertolucci pioneers new creations, where the 4Cs - the very essence of the brand – feature fully: Creativity, Curves, Comfort and Construction. In the Casual Chic world of Maison Bertolucci, the emphasis is on classic, timeless lines with their audacious, original design. Elements from miscellaneous influences mingle and interweave to design a new image, where casual, elegant and natural are the key features. Simple and sophisticated, refined and trendy, the Casual Chic models are easy-to-wear on all occasions and will enchant modern, elegant men and women seeking a unique design. This is a mysterious alliance of the sensuality and elegance of Latin women, a true incarnation of the brand spirit. The evocative curves of SERENA sketch an understated line, where the delicate shape wraps itself round the wrist in matchless comfort. This subtle blend of femininity, modernity and simplicity is the Casual Chic model for wearing at any time of day, a must for women seeking a timeless, bold design. 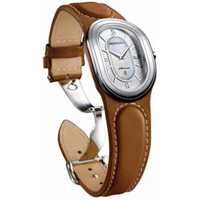 The Bertolucci icon, the SERENA trim is graceful and elegant, refined in the trend towards a well-size redesigned case. Its delicate silver-appliqué dial is encircled by a steel or 18-carat gold flower shape, adorned on some models by one or two rows of full-cut diamonds. SERENA explores and revisits an innovative design where the strap gives the illusion of passing through the case. Chic version with a fine natural leather worked strap finished in the ultimate saddle stitch or modern version with a steel bracelet, the many SERENA models feature a dial gently reflecting bursts of light from the harmonious blend of opalin and natural mother-of-pearl. Two seasonal models are joining the SERENA line, two trendy designs giving pride of place to Italian-style femininity with discrete, refined elegance. SERENA Python, its real snakeskin dial giving potency to the illusion of the strap passing through the case, taking on a wild appearance for a supremely chic model, a perfect match with the last trends. SERENA Olivier, with the olive branch, symbol of the Mediterranean, as its motif, is yet a further interpretation of this eternal source of inspiration for Bertolucci. It combines the purity of white and the sparkle of diamonds set on the dial and on the lacquered calfskin strap, creating a perfect reflection of light.